MAGA hats, however, hold special significance for some middle and high school students. Travel to any tourist destination in DC and you’ll see swaths of school groups, many of them wearing hats purchased at nearby souvenir shops. But for those for whom the phrase “Make America Great Again” refers to only a small slice of who or what “America” is, it isn’t just a hat. One Muslim American mother whose son went on a middle school trip to DC in which “every single white kid besides maybe one or two” returned wearing a MAGA hat said that the red caps became a familiar marker of exclusionary preteen politics. The author of that article would have never made the same sort of accusation about groups of teens that were wearing Obama caps, because that would not be a politically-correct thing to do. But somewhere along the line it became acceptable to label Donald Trump, all Republicans and anyone that supports them as “racists”, and all of this constant fueling of anger and hatred is going to have very serious implications for our nation down the road. Of course as more video evidence emerged, it quickly became clear that it was actually a group of radical leftist protesters that were attempting to intimidate those kids. As one group of protesters shouted insults at the kids that I can’t even print in this space, Nathan Phillips approached Nick Sandmann and started beating a drum just inches from his face. Who does such a thing to a young kid? And then somehow the media got everyone to believe that young Nick Sandmann was the aggressor, which was not true at all. 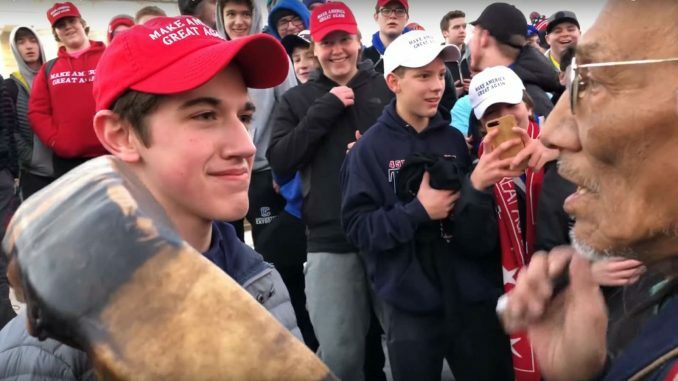 But what most people will ultimately remember about this story is the narrative that Sandmann was “attempting to intimidate” a member of the Native American community while wearing a large red MAGA hat on his head. “#MAGAkids go screaming, hats first, into the woodchipper,” Morrissey tweeted with a photo of a woodchipper. For now, Sandmann still apparently has his Twitter account. As does Kathy Griffin, who said things about Sandmann on Twitter that I cannot even repeat. And what was Sandmann’s crime? Simply smiling in the face of insults and persecution while wearing a MAGA hat. President Donald Trump’s administration “reached out” to offer support for the Covington Catholic High School students involved in a confrontation at the Lincoln Memorial over the weekend, but officials pushed back on a report that the students would visit the White House this week. Hopefully that visit will take place, because after everything that they have been through those kids certainly deserve it. We knew that this would happen if the American people gave control of the House to the Democrats. During the 2018 election, we needed to send Donald Trump some reinforcements, and we didn’t get that done. But now the 2020 election is coming up, and it will probably be the most pivotal election in any of our lifetimes up to this point. It will be another opportunity to fundamentally change the direction of our government, and this time we need to make it happen.